I’ve had countless problems with google maps and other map apps. They can be difficult to alter after they’ve begun, have outdated roads and poorly estimated ETA’s. All of those issues and more seem to be wiped away by this handy app. I’ve read that when the app was first released it was much more clunky and after undergoing several updates it is running smoothly. 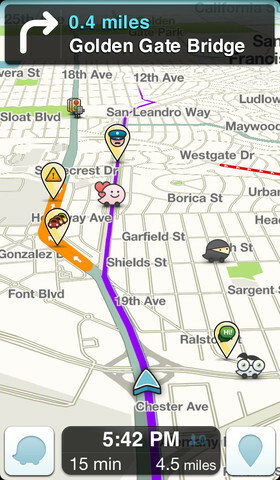 Your car is represented on Waze by a cartoon blob and if you are incredibly expressive and social you have the option to change the moods and accessories on your avatar. The default for the app is that your car and route will be visible to other users. The app does offer many alternate privacy settings so sharing isn’t necessary. A feature that is particularly helpful is the voice prompts. This offers the driver a completely hands free option when driving. Drivers can update the route for mistakes on the map, incorrect routes and to warn other drivers of where accidents have occurred or where police are hiding. Have you tried Waze? What do you think? Previous Ben Affleck does it again! Tonight’s BAFTA Best Director Winner! Next Missed the Grammys? Want to see your favorite band perform again?